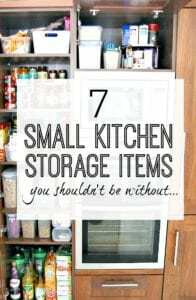 If you want to know which small kitchen storage items I use and love that make it so much easier to find things when I need them, then you’re in the right place! You don’t have to waste time scouring the shops – I’ve done the hard work for you! The kitchen is one of those places where you have lots of little bits and bobs to keep to hand and visible as much as possible. As a result of this, it can become very messy very quickly – so I wanted to give you some of the very best small kitchen storage items that I use in my own kitchen and that have transformed how it works for me. This is one of the most useful items I have in my kitchen – no doubt about it (I have 3 at the moment with plans for more!). You simply add your products onto it, and then when you open your cupboards you can spin it around so things that were once lost at the back now make it easily to the front – perfect! If you struggle with reaching to the back of your cupboards to grab something, or to see what’s there – or if you are constantly knocking things at the front over in your attempts to get at what you need – then a lazy susan is probably the answer. They are also great for condiments on your kitchen work surface, and for utilising corner cupboards better. I have used both single tiered lazy susans and double tiered** – which are especially useful in higher cupboards, or for storing smaller items like herbs or baking products. I LOVE to make use of every square inch of space in cupboards and in my house in general – and one of the ways we can all waste space is to not look at vertical storage as well as horizontal. By this I mean that we might have a shelf in a cupboard that’s full – but there is masses of space above the shelf that’s being wasted. Of course, it’s not practical or advisable to just put things on top of each other, so one great solution is to use these fantastic under shelf baskets** – they simply slot onto the shelf and create another shelf – perfect! These boxes are available in white and now a few other colours as well – but I love white as it’s clean and crisp for organising! SO useful – as you can contain lots of little things together, and easily pull out the container when you need something. Again – using the theme of making more of the vertical space in cupboards – these extra shelves** are amazing. I use them for the food cupboard where I keep canned goods. I hate stacking cans if I can help it, because they can easily topple over – and I like to be able to have two layers so that I can store different things on each if needed as well. They work particularly well at the back of a deep cupboard as well – so you can lift things a little higher than what’s at the front, so you can see (and reach) them better. Instead of stacking things up in cupboards, where you have to take everything out to get to the bottom one – I love to “file” them instead. By this I mean simply putting them on their side and storing them in a way that I can just pull out what I need at the time – like using a filing cabinet for paperwork. Bakeware is one of those items (along with cutting boards) that you can store by filing rather than stacking them on top of each other – and this rack makes that so much easier to do! Last but not least are tiered shelves**, another way to utilise all the space in your cupboards while making things accessible. I use them in my herbs and spices cupboard as these items are small and really easy to get lost at the back…. So – have I inspired you to tackle you kitchen cupboards soon? I really hope that these small kitchen storage products give you ideas for how to make your own cupboards look better and work better for you too. P.S. Have you joined in over on Facebook as yet? Organise My House has a page that is full of extra tips, questions, and lots of like minded people who are getting their lives simplified as we speak – if you would like to join in the conversation then just CLICK HERE – I’d love to say hi!